Prime® is the complete and concentrated conditioner for both fresh and saltwater. Prime® removes chlorine, chloramine and detoxifies ammonia. Prime® converts ammonia into a safe, non-toxic form that is readily removed by the tank’s biofilter. Prime® may be used during tank cycling to alleviate ammonia/nitrite toxicity. 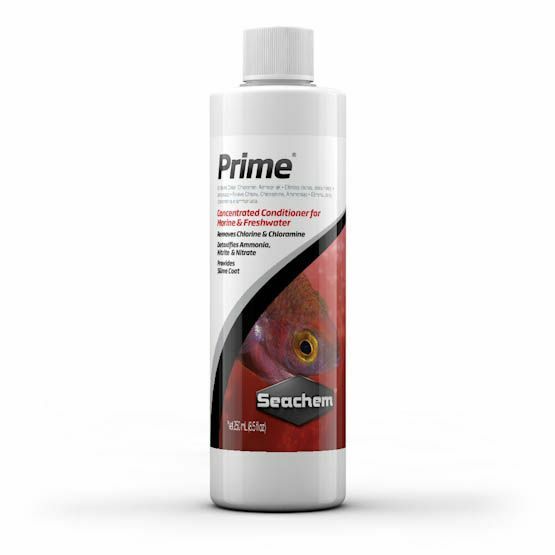 Prime® detoxifies nitrite and nitrate, allowing the biofilter to more efficiently remove them. It will also detoxify any heavy metals found in the tap water at typical concentration levels. Prime® is non-acidic and will not impact pH. Prime® will not overactivate skimmers. Use at start-up and whenever adding or replacing water. When transporting or quarantining fish, use Seachem StressGuard™. When adding new fish, use Stability®. Both are ideal for use with Prime®.